The Compositae, the family of plants to which the cinerarias belong, contains about seven hundred and sixty genera and over ten thousand species, embracing approximately one-tenth of all the flowering forms. This is the largest family of plants, and includes the goldenrod, the sunflower, the aster, the chrysanthemum, the thistle, the lettuce, the dandelion, and many others. The species are widely distributed, though more common in temperate or hot regions, the largest number being found in the Americas. Though a family of herbs, there are a few shrubs and in the tropics a small number of trees. The cultivated forms are numerous, and some are among our most beautiful fall plants. The flowers are collected together in heads, and sometimes are of two kinds (composite). Using the sunflower for an example, we find a disk of tubular flowers in the center and, growing around it, a row of strap-shaped flowers, while in the dandelion they are all strap-shaped, and in some other species all are tubular. 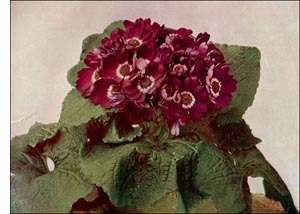 The cineraria is an excellent illustration of the composite form, which bears both kinds' of flowers. The cinerarias form a large genus of practically herbaceous plants, and are chiefly natives of southern Africa and southern and eastern Europe. The varieties vary greatly from white to pinkish-purple and through various shades to a dark bluish-purple. They are quite easily cultivated, but are house plants in temperate latitudes. They are peculiarly liable to attack of insects, plant-lice being especially an enemy. The florists' varieties are chiefly produced from the species Cineraria cruenta. Beautiful hybrids have been developed from this and other species, and the flower certainly deserves the popularity it has attained through sterling merit.